Imagine how much harder physics would be if electrons had feelings! – Richard Feynman, speaking at a Caltech graduation ceremony. Andrew Lo has a paper on uncertainty that is a good assessment of the types risks that we face in investments. 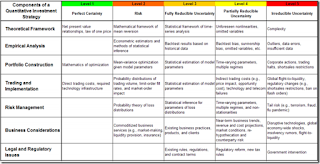 Risks can be placed along a continuum. 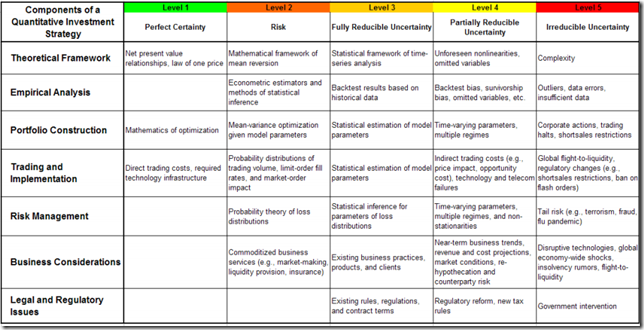 The levels of risk can move between perfect certainty where there is no risk, level 2 where there is risk but no uncertainty (rolling dice), level 3 which is fully reducible uncertainty (time series with error problem), level 4 partially reducible uncertainty (omitted variables), and level 5 which is complete uncertainty. Complete uncertainty is associated with events which cannot be measured. 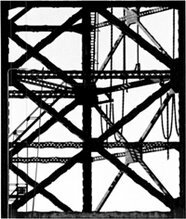 Our job is to understand the types of uncertainties we face, and minimize the risks from uncertainty. Where is global demand going to come from? Gas storage - what if we have no where to put it?